WEC Group Ltd has provided over 100 coded welding qualifications to staff since becoming a TWI (The Welding Institute) certified welder training centre earlier this year. As one of only a few TWI certified welder training centres in the North West, the company currently provides the qualifications internally to apprentices, skilled and semi-skilled welders as a way of enhancing their skillsets and improving quality throughout the company overall. 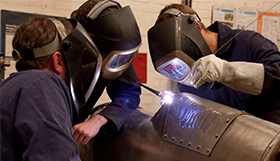 Since becoming accredited, WEC Group has saved £38,000 on external weld tests which used to take 4-5 weeks complete. They now take on average just one week to complete, from training to documentation. All the welders are trained and assessed in-house by WEC Group's Training & Development Manager, Kris Mercer, who is now one of just 50 CSWIP certified Master Welding Instructors globally as a result of completing a rigorous four month qualification process. Welders are then examined by William Barr, a former welding inspector at WEC Group who also passed four welding theory exams to achieve the new position of CSWIP Welding Examiner. Kris Mercer said: "The ability to train our own staff gives our welding personnel more knowledge on weld defects, causes and most of all preventative action which will make the company much stronger in the future." The Group will be opening up the welder qualifications to external personnel in the near future, offering qualifications in MIG, TIG and MMA welding processes. Our ability to train and accredit people to internationally recognised standards will enable us to boost the competitiveness of the other engineering companies. He added: "Our new TWI certified welder training centre status will enable us to fill our skilled vacancies as the company continues to grow, as well as giving local people who don't necessarily work here the opportunity to learn new welding skills." The new training service is a welcome addition to the Group's five-year advanced welding/fabrication, CNC machining (mechanical engineering) and technical production engineering apprenticeship schemes which are also delivered in-house as part of our Training Academy. We are currently employing apprentices at our sites in Lancashire, Yorkshire and the West Midlands to start in September 2017 and is also recruiting permanent and temporary Skilled Welders across the UK to join as soon as possible. Please visit our current vacancies page for more information.